Arrow Films’ Arrow Academy label has announced the February 2014 release of The Killers, which is coming to Blu-ray in the UK for the first time. One of the first post-noir movies, The Killers is a sizzling sun-drenched thriller packed with shadows where the darkness at the heart of its protagonists’ souls is allowed to rot in the heat of the day. Probably best known as the film which was originally intended to be the first TV movie, but pulled by broadcasters due to what was seen as overtly graphic violence, The Killers, most importantly, is the film which established Lee Marvin: achingly cool, unnervingly relaxed and physically daunting. "I gotta find out what makes a man decide not to run. Why all of a sudden he'd rather die." So muses hitman Charlie (Lee Marvin) after his high-priced victim Johnny North (John Cassavetes) gives in without a fight. Obsessed with the answer, Charlie and his hot-headed associate Lee (Clu Gulager) track down Johnny's associates, and uncover a complex web of crime and deceit involving his femme fatale girlfriend Sheila (Angie Dickinson) and ruthless mob boss Jack Browning (Ronald Reagan in his last screen role). Loosely inspired by the Ernest Hemingway story, and directed by Don Siegel (whose many other taut, efficient thrillers include Dirty Harry and the original Invasion of the Body Snatchers), The Killers was commissioned as the very first 'TV movie', but was given a cinema release because of its violence – although a cast like that really belonged on the big screen in the first place. This feature-packed disc will be released as a deluxe Blu-ray featuring original and newly commissioned artwork, an archive interview with director Don Siegel, new and exclusive interviews with Dwayne Epstein, author of 'Lee Marvin: Point Blank' and Marc Eliot, author of 'Ronald Reagan: The Hollywood Years', alongside an exclusive collector’s booklet featuring new writing on the film by Mike Sutton, extracts from Don Siegel’s autobiography and contemporary reviews. Here for the first time on Blu-ray, Arrow Academy is releasing the film in both the alternate widescreen framing (1.85:1) and the more commonly seen 1.33:1/4:3 version. The Killers was originally commissioned as the first American TV movie, though it was intended from the outset to be released in European cinemas. However, following the JFK assassination, NBC became nervous about the film's subject matter, and the film debuted in American cinemas instead. But because of the original plans, previous video releases have treated The Killers as a TV movie and framed it at the then-universal TV shape of 1.33:1/4:3. 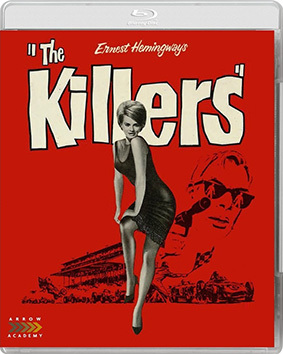 The Killers will be released on UK Blu-ray for the first time on 24th February 2014 by Arrow Films as part of The Arrow Academy label at the RRP of £24.99. Archive interview with Don Siegel (1984) from the French television series Cinéma Cinémas.